French economist Gaël Giraud, S.J., (from left) discusses economic inequality with Professor Michael Schuck and Monsignor Michael M. Boland of Catholic Charities of Chicago. Quinlan’s 2015-16 Signature Series concluded on April 21, with nearly 120 business leaders, faculty, staff, students, and alumni converging on Quinlan to explore the intersection of business and social justice. Speakers sought to answer the question, “Can business help create a just world?” in light of Pope Francis’s harsh critiques of modern capitalism. 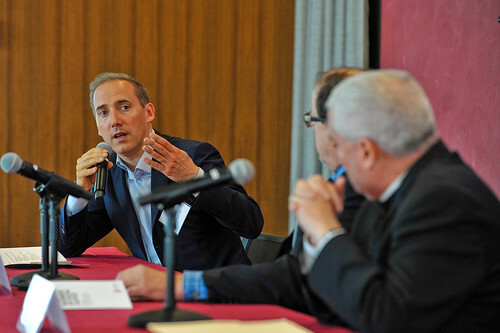 Leading French economist Gaël Giraud, S.J., was the featured speaker, with a panel comprised of Monsignor Michael M. Boland, president and CEO of Catholic Charities of Chicago, and Michael Schuck, professor of theology at Loyola. Kevin Stevens, Quinlan’s dean, and Michael J. Garanzini, S.J., Loyola’s chancellor, delivered the opening remarks. Garanzini then called attention to the international Society of Jesus report, “Justice in the Global Economy: Building Sustainable and Inclusive Communities,” and the issues highlighted in the report. Giraud’s address, “Pope Francis’ Integral Ecology: The Viewpoint of a Jesuit Economist,” touched on a variety of topics, including Pope Francis’s statements about the need to steward the environment, the environmental impact of developing economies, and the need to reduce our carbon footprint. Energy drives economic growth, Giraud said, but when developing countries increase their carbon output, it has repercussions across the globe. Even if carbon emissions cease globally, the Earth is still on a warming trajectory. Giraud said scientists suggest an increase of more then two degrees would have dire consequences for communities around the world, especially in Africa. Schuck used the trope of a papal serial novel to describe the story of economic justice, as told by papal encyclicals. The “novel” begins in the 1890s, with Pope Leo XIII’s Rerum Novarum, which tells the story of the conflict between workers and industrial business owners in a market economy. The novel’s latest installment is Pope Francis’s Laudato Si’ and the theme of unprecedented environmental deterioration and the need for a sustainable model of production. In the evening, another 65 students and others gathered for a panel discussion on redressing economic inequality. The panel featured Giraud, Nicki Pecori Fioretti, MBA ’96, of the Illinois Housing Development Authority, and Quinlan professors Timothy Classen, Tassos Malliaris, Linda Tuncay-Zayer, and Clifford Shultz. Quinlan’s Signature Series will continue next year, with a continued focus on economic inequality. View photos from the event in the gallery below or on Quinlan’s Flickr page.